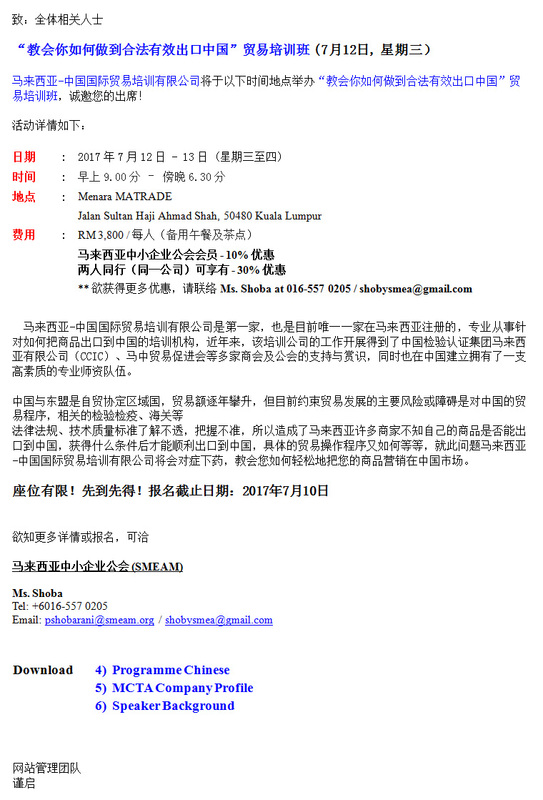 PROGRAMME ON “THE WAY TO LEGALLY AND EFFECTIVELY EXPORT TO CHINA"
We are pleased to inform that, MC Trading Academy Sdn Bhd (MCTA) would like to invite you to participate in the Programme on “The Way to legally and effectively Export to China” trade training courses on 12th ~ 13th July, 2017. **Please call Ms. Shoba at (016-557 0205 or [email protected]) for more discounts! MC Trading Academy Sdn. Bhd. is the first and only one company registered in Malaysia specialized in providing training and guidelines of how to export goods to China. The objective of setting up the company has been highly recognized and support by CCIC Malaysia Commodities Inspection Sdn. Bhd. (CCIC Malaysia), Malaysia-China Trade Promotion Association and other Chamber of Commerce in Malaysia. The training and guidelines will be carried out by a team of professional lecturers from China. China and ASEAN are FTA countries, the trade volume is on the rising trend from year to year. However, there are few risks and obstacles regarding the trade development which mainly due to the complicity of trade procedures, relevant inspection, custom clearance, and the laws and regulations. The main objective of this training and guidelines provided is to focus on the requirement, specification; trade procedures for their goods can be successfully exported to China. MC Trading Academy Sdn. Bhd. is the right and only channel which will guide you how to export and market your merchandise in China.